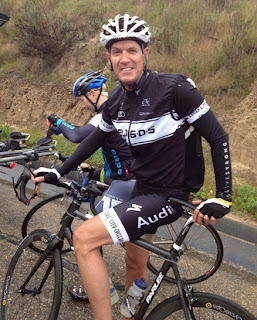 Greg is an amateur rider taking part in the CTS Amgen Tour of California Race Experience, also known as the guided tour for amateurs riding every stage of the 2012 Amgen Tour of California ahead of the pros. This is the third year that Carmichael Training Systems will provide this ultimate race simulation challenge for avid cyclists. 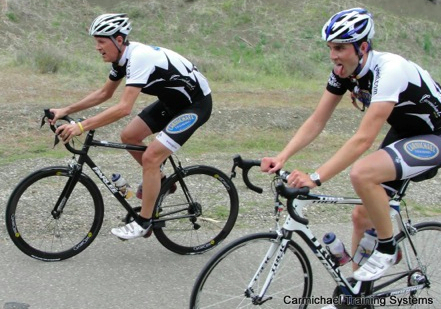 They will also be providing the experience at the Tour of Utah and the USA Pro Cycling Challenge in Colorado. Pedal Dancer would like to introduce you to Greg. We will be following Greg's journey as he tackles every stage of the ATOC along with 22 total riders in his group of high achievers. Greg's goal is to "do every stage," he said. 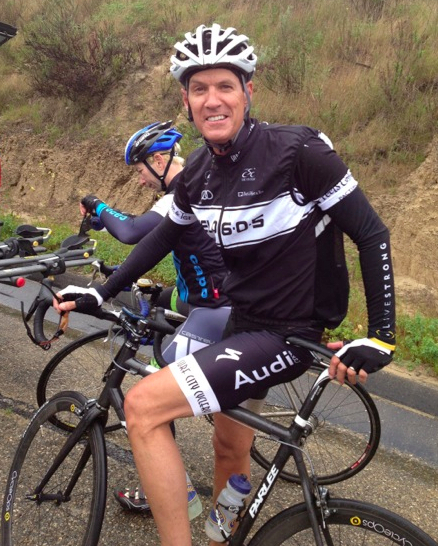 The Amgen Tour of California is 750-miles over 8 days. Carmichael Training Systems' (CTS) group will be fully supported, with support vehicles, hotels, food, 3 mechanics, 3 masseurs, 5-7 coaches, and VIP passes. Chris Carmichael will be riding every single day with the team. The ticket price ain't cheap at between 10-11K for the week, plus they have to start riding by 7:00am most days, and ultimately they have to pedal every mile, but what an incredible challenge for an amateur. Their goal - to beat the pros to the finish line! Greg has met only five of the riders he will be spending the week with. One rider is from Switzerland, 1 from Australia, 1 from New Mexico, another from the east coast, only 1 is a woman. They are gathering in Santa Rosa this weekend to begin the first of 8 stages on Sunday, May 13th. Greg has been provided with a Race Bible with complete daily details. "We have rules, and there are fines if we break the rules," Greg said. The guides are serious about getting Greg's group across the finish line of every stage ahead of the pros, to add both incentive and fun, the riders will be fined for arriving late for meals or start times, for not dressing to code, loosing items, not communicating, over-use of cell phones, not hydrating, and most importantly not having fun. All fines are to be paid to KidsonBikes.net as a fundraiser. At 6'4" and 180lbs Greg considers himself a big rider, but enjoys hill climbs, "the harder the better," he said. He expects the race experience to be "very hard, but fun". He is most looking forward to riding Stage 6 of the Amgen Tour of California from Palmdale to Big Bear because the route is unknown to him. 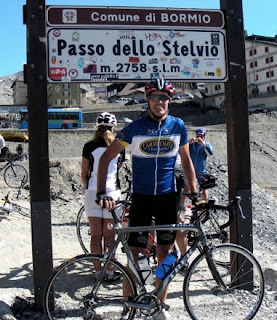 Last year he participated in the l'Etape du California up Mt Baldy, he suffered, but two months later when he saw CTS again advertise for this ride, he immediately signed up. He figured "if they choose me, I'm in." Greg is certainly in and ready for the challenge. When I asked him what was the most important factor in preparing to ride every stage, he answered, "miles, and completing the required power allotments." He has used Carmichael Training system for coaching since 2008, when he became a client to prepare for an Andy Hampsten cycling tour to the Dolomites. When I asked Greg what he thought would be the most important factor during the race, he acknowledged this part was "way more important: Don't go too hard too early," he replied, "Second is nutrition, third is routine." He added that a set routine every day reduces his stress. Greg Brown would know about how to prepare for a race, he competed in triathlons for 18 years, 7 as a professional in Australia. In fact Greg has a story of competing at the Bermuda Triathlon in 1986 or 87 for $100,000 in prize money, "All the guys were there - Mark Allen, Scott Tinley, and some new young cocky kid named - Lance Armstrong. Greg was 30-years old and thrilled when he passed 15-year old Armstrong on the run to take 8th ahead of Armstrong's 12th. Every CTS team member will be provided VIP passes at stage finishes, I asked Greg if he plans to attend as a fan after he rides the stage. "Absolutely. I hope I have the energy, I'll make myself have the energy, that will be half the fun." There will be a sag wagon if one of the 22 riders needs to abandon for the day, but let's think positive and root for Greg Brown, if you happen to see a 6'4" cyclist on a Parlee in a Chris Carmichael kit (below) - cheer really loud - "Go Greg, Allez!" Favorite sports: Basketball (played in High School, College, Finland, and in Australia). Proudest achievement in life: his 2 kids, twins:1 boy, 1 girl. Both finishing their 1st year of college. Groupo and gearing: Shimano Di2 electronic, Compact 53-39 12-27 (the same gearing he rode over the Stelvio). Next big adventure: Greg and his wife are moving to London in July. He looks forward to learning about cycling in England. Pedal Dancer will be following Greg during Stage 5, 6, 7, 8. Pedal Dancer photographer Willie Reichenstein and Greg Brown are good friends (Greg also coached my nephew Kevin in Basketball). If you are wondering about the logistics of a team of 22 riders coming through prior to the pros, Greg said they follow all the traffic rules as everyone else and do not have priority, rolling closures or road closures like the pros. They will begin most mornings by 7:00am, 3 or more hours before the pros depart. Their goal - to beat the pros to the finish line. Good Luck Greg!